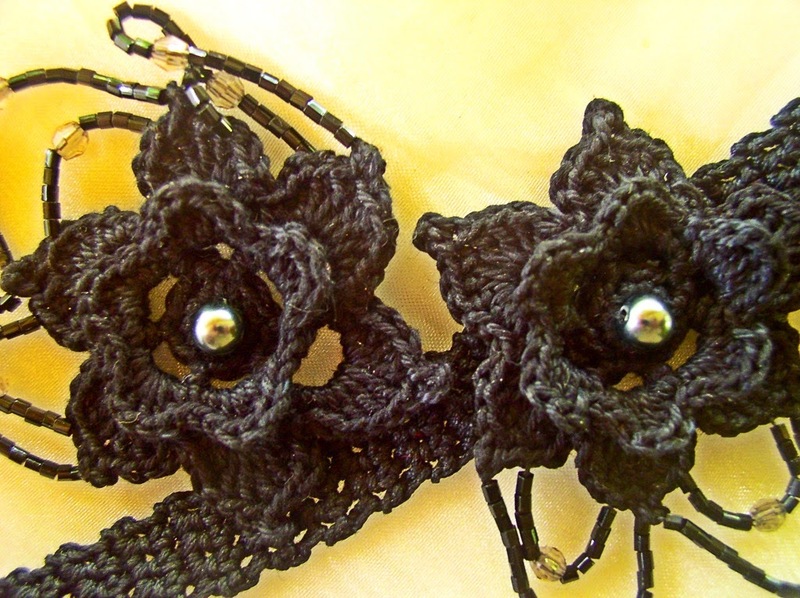 Those Irish crochet flowers are very popular. 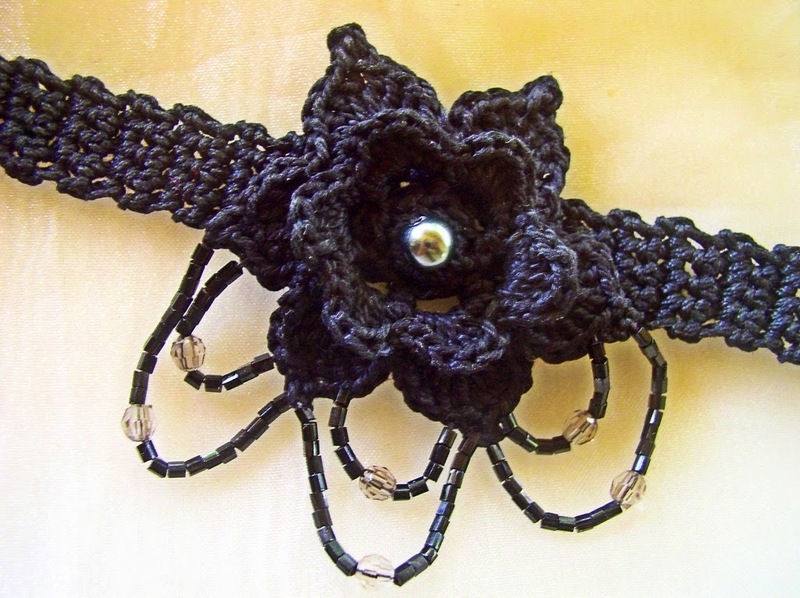 And there are lots of crochet flower patterns out there. You can easily give those a makeover to make lovely jewellery for yourself. The yarn I used is Hamanaka Lacy Crochet cotton size 8, and the hook is1mm steel. I used black cut beads, clear acrylic beads, and a shiny gray acrylic bead in the centre of the flower. Here is the pattern for the flower. Ch 5. Sl st in first ch to make ring. Rnd 1: Ch 1, 12 sc in ring. Sl st in first sc to join. Rnd 2: Ch 1, sc in first sc, *ch 3, sk next sc, sc in next sc, rep fr * 5 more times, ending the last rep with sl st in first sc to join. Rnd 3: Ch 1, *in next 3-ch loop make (sc, hdc, 3 dc, hdc, sc), rep fr * 5 more times, sl st in first ch to join. Rnd 4: Ch 6, back-post sc around next sc between first and second petals, *ch 5, back-post sc around next sc between next petals, rep fr * all around ending with ch 5, sl st in first ch made at the beg of the rnd. Rnd 5: Sl st in 6-ch sp, ch 1, in same ch sp make (sc, hdc, 3 dc, picot, 3 dc, hdc, sc), *in next ch sp make (sc, hdc, 3 dc, picot, 3 dc, hdc, sc), rep fr * all around. End with sl st in first ch made at beg of the rnd to join. Fasten off. Lay the flower flat on a few layers of clean cloth. Spray or dab with commercial fabric stiffener. You can also prepare your own fabric stiffener as follows: dissolve 1 tsp cornstarch in one cup of water in a saucepan. Add a tsp of vinegar or salt as preservative. Bring to a gentle boil stirring constantly. Let cool and pour into a spray bottle. You can also use a brush to apply the starch solution instead of spraying. You can also dip the motif into the starch solution and press out excess with your fingers. While wet, use your fingers to shape the crocheted flower. When done, let the piece dry completely for at least two to three days. Decorate the flower with beads as shown in the photograph. I used a thin beading needle to thread the tiny cut beads. The outer loops are (10 cut beads, 1 acrylic bead, 10 cut beads) and the inner loops are (5 cut beads, 1 acrylic bead, 5 cut beads). Then sew the larger gray bead (or other bead or stone of your choice) in the centre of the flower. The strap is easy to make. 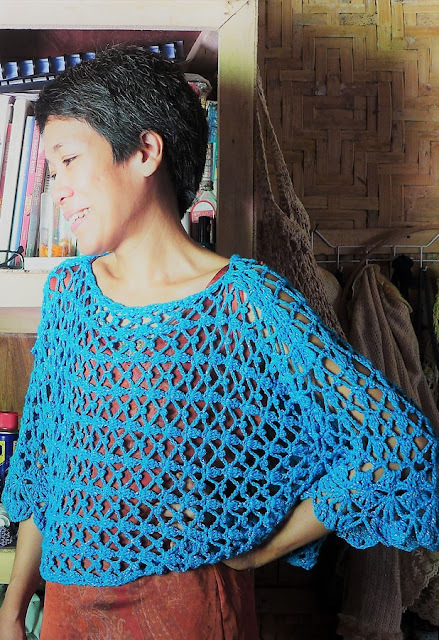 I used Hamanaka Lacy Crochet cotton size 8, and the hook is1mm steel. Row 1: Ch 5, sc in 2nd ch fr hook, sc in each of next 3 sc (4 sc made). Ch 1, turn. Row 2: Sc in each sc across (4 sc made). Ch 1, turn. Succeeding Rows: Repeat row 2 to desired length. A choker length necklace is about 12-13 inches. Fasten off. 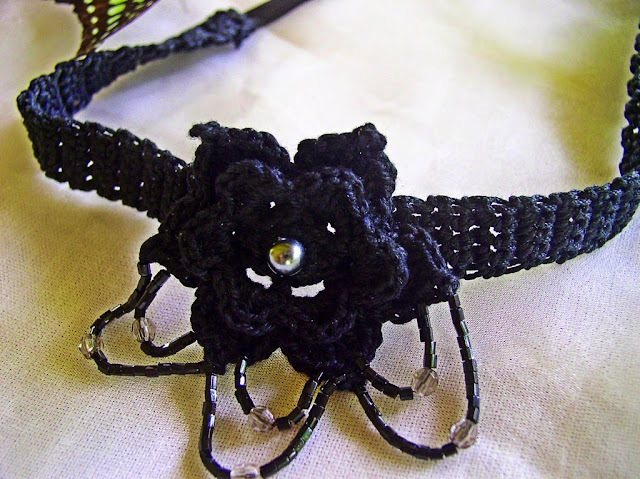 Sew the flower onto the center of the crocheted strap. 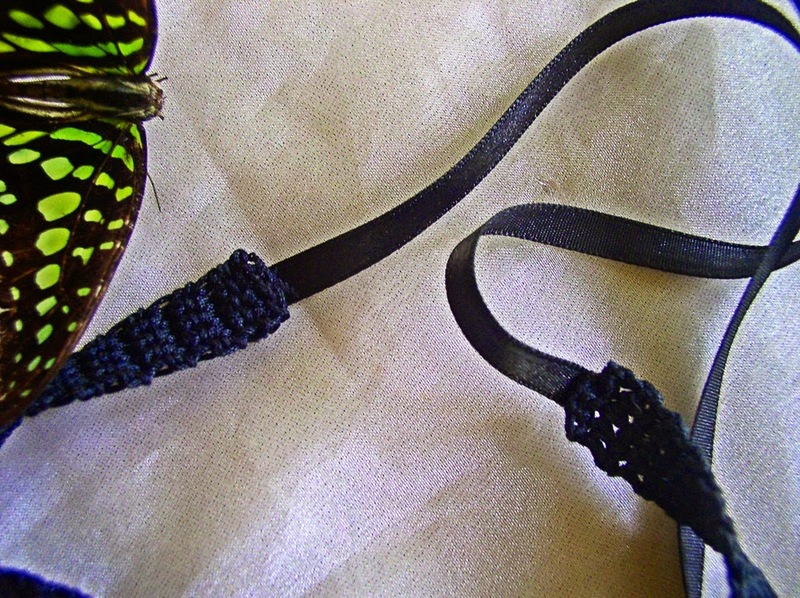 To tie, use black satin ribbon. 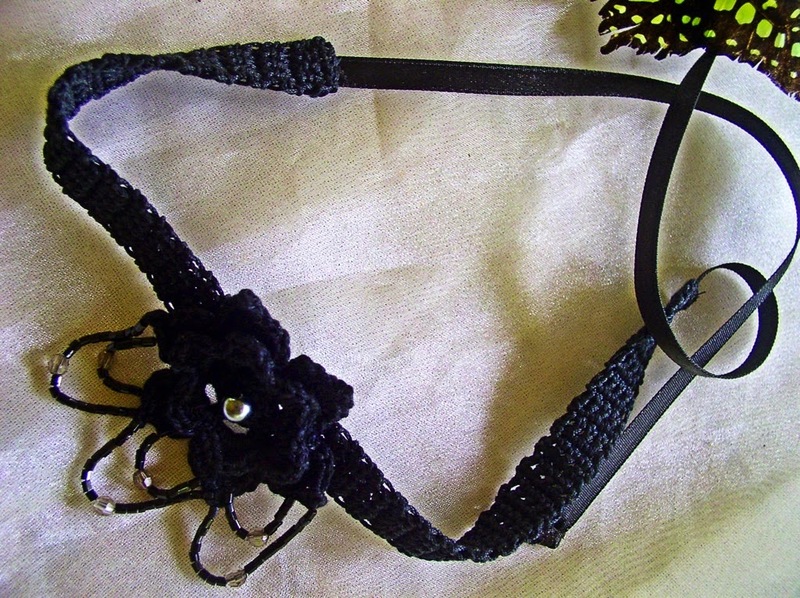 Sew the ribbons to the ends of the crocheted strap. The ribbons should be just long enough to tie into a bow, maybe about 10 inches long each.